One of my favorite stories in the Old Testament is a part of the maturing of Moses. From the beginning, his life hung in the balance. Pharaoh tried to have him killed, even as a baby, but in a strange twist of events, Pharaoh’s daughter adopted Moses as her own. Moses was called to free the captive Israelites, and he accepted that calling. He began by killing an Egyptian who was abusing one of his Hebrew brothers. Unfortunately, the timing was wrong. Word of the murder spread fast and Moses fled Egypt. He spent the next 40 years as a husband, a father, and a shepherd. It was at the end of that 40 years that God appeared to Moses in a burning bush and asked him to go and free the Israelites from their Egyptian oppressors. But, at this point in his life, Moses was old and unsure of himself. It was exactly at this point that he could be used. The reason I like this story is because it has repeated itself over and over in my life. Not just once have I charged ahead in my attempts to do the right thing. Each time, retreating into a period of reflection, vowing to not be impatient again. Yet to repeat the error in another time and another space. It sneaks up on me and happens imperceptibly. I don’t even see it happening until it’s over. It really is amazing. It really is true that our greatest strengths can be our greatest weaknesses. When I took the StrengthFinders assessment a few years ago, it was eyeopening – not so much in it’s content as in its revelations. Confidence, Responsibility, Achievement, Command, and Ideation. The Wife said, “No wonder you intimidate people.” I recognized the traits, for I’ve lived with them for 50 years. Arriving in Columbia County was a surprise to us. It was a surreal experience that we are still trying to absorb. We love it here and we love the people we’ve met. We love the people we work with and we love the place in time and space where we have landed; however, it has been challenging. I thought I heard them say they wanted a leader. I thought I heard them say they wanted to grow. I thought I heard them say they were willing to pay the price. So, in typical fashion, I grabbed the responsibility, with confidence and assurance, knowing that it would be difficult, but I was willing to tell people what they didn’t want to hear, and I charged forward – because I had ideas. Those strengths allowed me to ignore the naysayers. I’m able to ignore the pain that comes before the growth. I can ignore the people who talk about me behind my back, or who leave. I’m OK with the pain, because I have my eye on a bigger picture. But it is exactly those same strengths that cause me to ignore the fact that I’m taking this hill by myself. I may be charging the enemy of growth and success, but I’m doing it alone – and therefore I won’t be successful. As volunteer firefighters, my college roommate and I started “fixing” the small volunteer department we were with. Of course we were from the big city and we knew better. For some strange reason, the good ol’ boys just didn’t seem to appreciate our efforts. Later as a streetwise medic, I began to fix the old guard fire district. EMS was the new way and they just didn’t see it. I remember an epiphany I had after I’d been in management/leadership for a couple of years. I had this image of what people probably said after leaving a meeting. “You know, he’s right,” I pictured them saying, “but I sure hate working with him.” It was after that when I began to back off and cooperate a bit more. They say those who learn to compromise usually end up getting the most accomplished. I began to ask myself if what I was fighting for would really make any difference in 100 years. Usually it wouldn’t. Last year I began working to streamline the leadership systems and prepare for the future. I talked about the inefficiencies of having two leadership groups. I talked about span of communication and how I needed a team of not more than nine, nor less than five. I talked about having a governing board, not a management board. Each time, I saw heads nod in agreement and I again charged forward. Yet, every two months, we would repeat the conversation. Tonight, I approached the meeting with a humble attitude. I didn’t approach as if I had all the answers. I saw that I had failed to make my case. I began to see that I needed to listen better. I came with an attitude of flexibility. I’m glad I did. For the first time, I heard clearly that they weren’t buying my ideas. I heard that any change needs to be more organic. I came away humbled – but also like a load has been taken off of my shoulders. I still have much to learn. I still need to listen more. I have followed your blog for awhile now. I know you say you are a life coach but I understand you are really a spiritual leader of a small church in Columbia County. When I read “I can ignore the people who talk about me behind my back, or “who leave.” I’m OK with the pain, because I have my eye on a bigger picture”, I wondered just what the bigger picture was that would allow you to ignore those who leave. (Have you read the parable about the one lost sheep?) I wondered if you are listening to what those who talk about you are really saying? Maybe your community doesn’t want you to fix them; maybe they want Jesus to do that. Maybe they want a clearer sense of community. @Jules, thanks for the feedback. I’ve been very careful, from the beginning, to let the faith communities I serve know that I view myself more as a coach and/or a mentor. I’m not very gifted, or experienced as a nurturer, or mercy-giver. My strengths lie more in the area of “truth-teller.” My work encompasses faith communities and communities not associated with any particular faith. You’ll notice, that at the end of this blog post, I agree with your conclusions. Most of my posts are cathartic journeys through a particular issue. 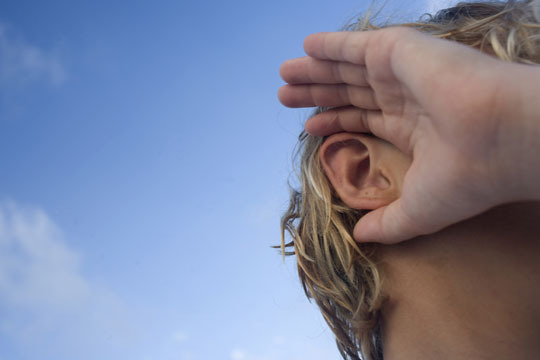 This post is a journey from being a stubborn “fixer” to being a more active “listener” – which is exemplified by the photo of the listening man. Also, a clearer sense of community is exactly where I’m headed – but some of the people who have left, are those who don’t agree with my methods of accomplishing that. Reading through the book of Exodus, one gets a clear picture that a whole generation had to be left behind before they grasped that unified community and were ready to cross over into the Promised Land. Thanks again for the feedback. I appreciate the reality checks.